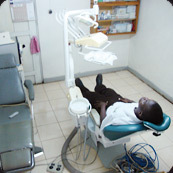 PRO HOMINE donated dental chairs, which are being used to this day. Dr. Magara employs seven doctors in his clinic. 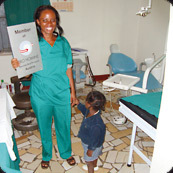 Enid N. Kambale holds a Diploma in Dentistry. PRO HOMINE has provided training for her in Uganda as well as in Austria and has also made donations to her practice. She holds a Diploma in Dentistry and is about to finish her Degree in Dentistry. PRO HOMINE has provided training for Mrs. Sempagala in Uganda as well as in Austria and has also made donations to her practice. He holds a Diploma in Dentistry. 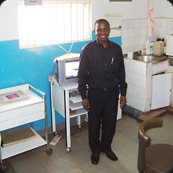 PRO HOMINE has provided training for Mr. Kibaya in Uganda and Austria and has also made donations to his practice. He holds a Diploma in Dentistry. PRO HOMINE has provided training for Mr. Dyabe in Uganda as well as in Austria and has supported his practice with donations. He holds a Diploma in Dentistry. PRO HOMINE has provided training for Mr. Awio in Uganda and Austria and has supported his practice with donations.